Common Name: Polyporus grifolia, Umbellate pore-fungus, Polyporus sclerotium. Part Used & Method for Pharmaceutical Preparations: The fungus is gathered in spring or autumn, cleaned, dried in the sun and cut into slices. Meridians: Kidney and urinary bladder. Functions: To transform dampness and promote water metabolism. Indications & Combinations: Dysuria, turbid urine, edema, diarrhea and profuse leukorrhea. 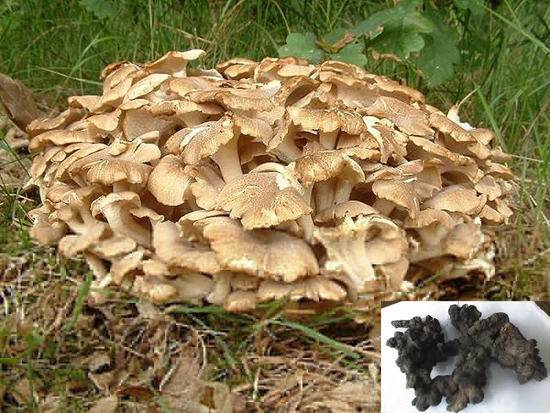 Umbellate pore-fungus (Zhuling) is used with Poria (Fuling) and Alismatis rhizome (Zexie) in the formula Siling San. Dosage: 5-10 g, decocted in water for an oral dose or used as powder.